A couple interesting pieces of news have come across my desk this morning, and it looks like the Russian ebook market is heating up. 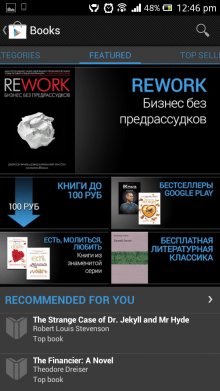 Google has quietly expanded Google Play Books to Russia this morning. There's been no official announcement, but Android users in Russia have reported that they are now able to buy ebooks and rent/buy movies in Google Play. The movie prices start at 49 rubles for a rental and 149 rubles to buy. eBooks prices start at 49 rubles. There's no news yet on the selection available or the sources of the ebooks, but users have noted that there are free titles listed. In other news, there's a new rumor circulating about a Russian launch for the Nook family of gadgets. According to The-eBook.org, a Russian blog and ebook community, Barnes & Noble is most definitely talking to content providers and large distributors in Russia. That ties in well a rumor which I had heard before, but here is something new. The-eBook.org isn't just repeating a rumor about ongoing talks; they also claim to know the retail prices for the Nook when it launches in the Russian market. They don't say where they got these prices, but the Nook HD is expected to cost 9190 rubles (~$299 USD), and the Nook Touch 5490 rubles (~$179 USD). This decision can not be considered spontaneous. Barnes & Noble company and its employees actively explored the Russian market in the past two years. It is the only company to contact with us on various technical issues. I've been following that site for several years now and they have usually been quite. They have good contacts in the Russian digital publishing industry and among gadget makers, so it is more than likely that the price info isn't a rumor but actually came from an insider. I would say that this makes the Nook launch in Russia a near certainty, wouldn't you? That's a good, because at this point only one of the major platforms have a presence there, and it's not Kindle, iBooks, or Kobo. The sooner more of the majors launch in the country the faster the market will grow. Nice find. The “NOOK in Russia” thing looks totally credible. The device pricing looks high to me, but I guess there’s less quality competition over there. Good way of bringing their average selling prices back up.